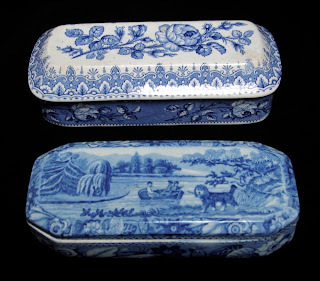 I saw a lidded rectangular ceramic box printed in blue in a junk shop in the 1960s. Neither the owner of the shop nor I knew its purpose. I thought it would be useful to hold Brillo (pot scrubbing wire mesh) or soap. As the years went by, I was told the box was used to hold razors or toothbrushes. Now I know the boxes were probably just for toothbrushes. Only a safety razor would fit in it, not the large razors used when the box was new. "The Dictionary of Blue and White Printed Pottery 1780-1880" by A.W. Coysh and R.K. Henrywood says the box was often called a toilet box and was included in a toilet set to hold toothsticks. "In Georgian times a toothstick was made by wrapping a clean piece of cloth around one end of a stick. This was then used to clean the teeth using lemon juice mixed with salt to whiten them." I will add that my dentist said that lemon juice used regularly will remove the enamel from your teeth! 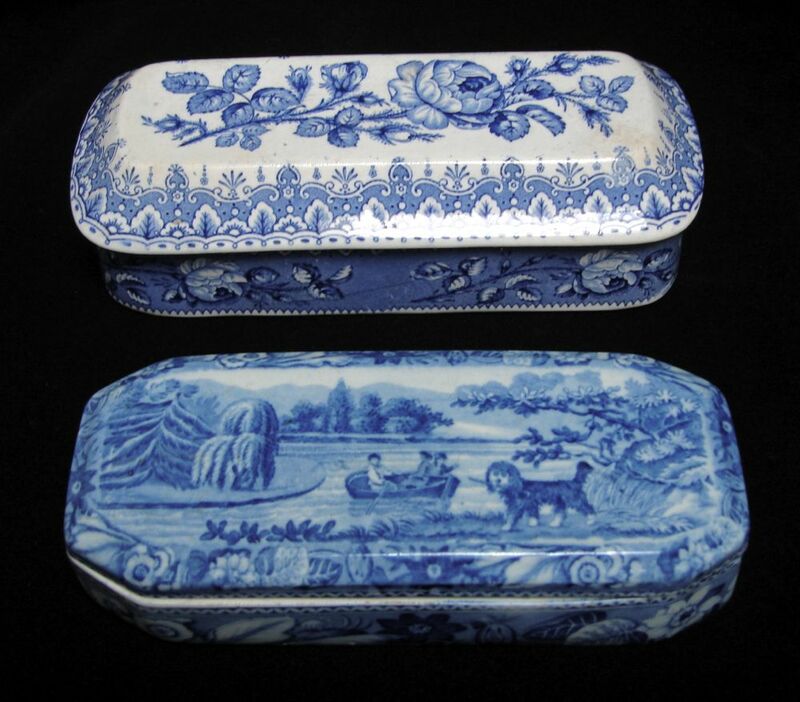 Below are two toothstick or toothbrush boxes from the 1820s and 1830s. Later toothstick boxes might have a handle on the lid as well as pierced holes for ventilation. *You only see a partial view of the Comb Bank, Kent pattern. Comb Bank (the great house) is missing! The dog and boat are copied from an oil painting by Philip Reinagle (1749-1833) titled "Water Dog." Thanks, Judie. This is the first that I have heard about "tooth sticks"! There are many transferware forms from the past for which we do not know what they were used for. Love the British Views pattern with the doggie with a stick! The "British Scenery" pattern is #515 in the db. It features Comb Bank, Kent, which either doesn't appear on the lid or is hard to see. The pattern is also known as Water Dog.